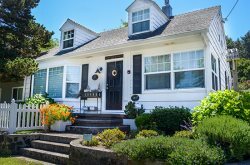 We have worked with Cannon Beach Vacation Rentals before and remain impressed with the property inventory and the customer service. Also, we greatly appreciate the extra touches: a Christmas tree and wreath placed at the property helped make our holiday extra bright - Thank you! One of the best vacations of my life, we will be back. It was a lovely weekend and meeting the staff when we stopped in at the office was delightful! Efficient, friendly and very helpful. We had a really fantastic week. Loved the condo overall and would likely return. Thank you for offering dog friendly choices also!